In 1889, Mrs. Hermann Oelrichs commissioned the architect Stanford White, of the firm McKim, Mead and White, to design a summer house for her entertaining. White modeled the house after Marie Antoinette's Grand Trianon at Versailles, and replaced a less opulent mansion. Before the Oelrichs and Stanford White transformed the property, George Bancroft owned the original cottage on the site. 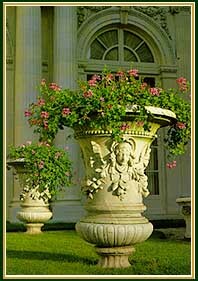 Mr. Bancroft was a noted historian, Secretary of the Navy and an amateur horticulturalist who developed the American Beauty Rose -- hence, the estate was named after its many rose beds. 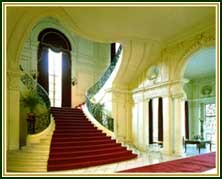 The new Rosecliff was started in 1899 and completed in 1902 at a reported cost of $2.5 million. Mrs. Hermann Oelrichs was born Theresa Fair in Virginia City, Nevada. Her wealthy Irish immigrant father, James Graham Fair, was a partner in the firm of McKay, Flood and O'Brien, of the Comstock Silver Lode in Nevada, one the richest silver finds in history. During a summer in Newport, Theresa met Hermann Oelrichs playing tennis at the Newport Casino. They were married in 1890. 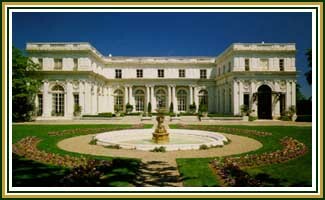 Mrs. Oelrichs became a leader in Newport society and Rosecliff became famous for its lavish and innovative receptions, and its 40-foot by 80-foot ballroom -- with windows opening into terraces -- the scene of brilliant parties. The interior displays elaborate plasterwork, a Caen Stone carved fireplace, hand-painted washbasins, 18th- and 19th-century sculptures, and exquisite antique furnishings, while the exterior is finished in white glazed terra-cotta blocks, which were a novel feature in the early 1900's. Sculptor Augustus Saint-Gaudens provided the garden ornamentation, including the Court of Love. The mansion is now preserved through the generosity of its last private owners, Mr. And Mrs. J. Edgar Monroe, of New Orleans. They gave the house, its furnishings, and an endowment to the Preservation Society in 1971. 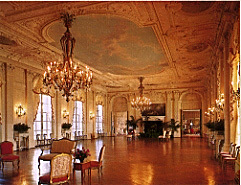 Scenes from several films have been shot on location at Rosecliff, including High Society, The Great Gatsby in 1974, True Lies (where Arnold Schwarzeneggar danced the tango in its opulent ballroom) in 1994, and Amistad.